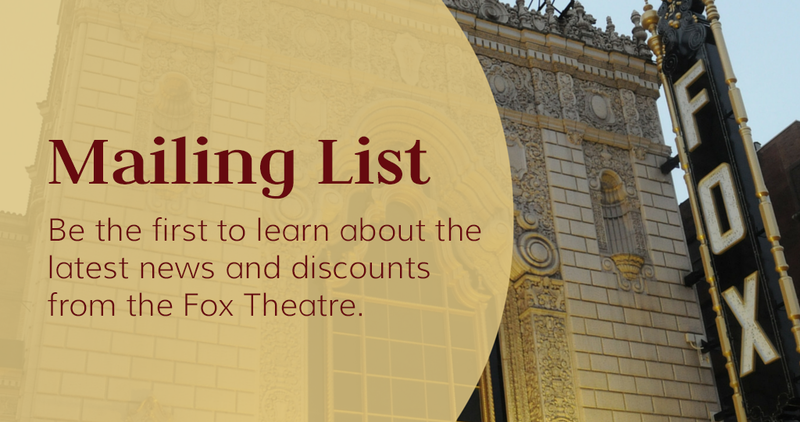 The Fox Theatre periodically offers pre-sale opportunities, discount information, and event notifications. Sign up for this list if you would like to receive these email notifications and offers. Discounts are often available for groups of 15 or more for shows at the Fox Theatre. Sign up for this list if you would like to receive occasional email notifications about these discount opportunities. Discounts and other special offers are occasionally available for students and teachers for shows at the Fox Theatre. Sign up for this list if you would like to receive occasional email notifications about these discount opportunities.